Direct metal laser sintering (DMLS) "Heavy Metal" 3D printing is an additive manufacturing technique that uses a laser fired into a bed of powdered metal, aiming the laser automatically at points in space defined by a 3D model. The laser welds the material together to create a solid structure. Lasers. Metal. Yep, 3D Metal Printing is a working 3D print solution. Although it keeps the same basic principles as other forms of 3D printing, one main difference is the fact it welds metal material together as appose to melting them together. And of course it’s metal instead of a form of plastic. But what is there to know? Is it really worth the cost? 40 micron layers of metal powder on top of each other to create metal parts. This additive process is similar to 3D printing, although metal powder is spread across a build platform and welded instead of a plastic filament being extruded. We can always come up with some pros of a situation, so how about we start with the cons of 3D printing. In general 3D printing already has its limitations. The most obvious one is that the technology is in today’s world considered an infant and has barely begun to crawl. There are some applications, but we're all trying to figure out this kid's potential. Another limitation we find is the speed of printing. This could be improved over time, but in the meantime 3D printing may not be as timely and cost effective as one would think. 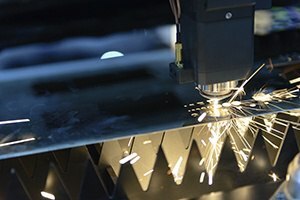 There are other cons in general about 3D Printing such as waste control, and techniques being difficult to master “out of the box.” When working with metal there are additional safety concerns, and a limited availability of applications. HOWEVER, pros would be that parts created using DMLS are fully dense metal with excellent mechanical properties. Other metal 3D printing processes exist that use a binder, although they produce parts which are not fully dense metal. The DMLS process can produce complex geometries which traditional CNC (computer numerical control) machining processes are not capable of. While these machines are still a work in progress, it opens up the possibility of 3D metal printing for medium and small businesses, and even dedicated hobbyists. The open availability and sources available make this an opportunity for improvement on producing metal parts, and it also levels the playing field for smaller businesses. As exploration of 3D metal printing continues, larger and more intricate parts will be able to be created on-demand, eliminating the need for businesses to order outside products which will reduce cost for businesses and consumers all around. Gil Mayron is AIS’ Director of 3D. An entrepreneur in 3D printing, Gil’s startup, BotMill, was the first to bring an assembled consumer 3D printer to the market for under $2,000. At AIS, he is focused on helping customers use 3D printing effectively and talking to new and existing customers to push the boundaries of 3D printing. He is also the current #1 Nintendo Wii tennis player in the world.